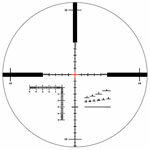 The K1050 Field Target has been developed to meet highest precision for sport shooting on small targets at long distances. This high grade and equally compact scope offers to the shooter an incomparable experience with regard to its precision. With his special parallax adjustment which focuses from of 9-65 yard distance and the illuminated reticle in the second focal plane, this rifle scope is perfectly optimized for the Field Target competition.